As a kid, two qualities helped decide my favorite baseball players: 1) Did he routinely do something I cannot do, and 2) did he have a fun name? Wily Mo Pena, Juan Pierre, and Magglio Ordonez usually topped the list, and Ken Griffey Jr., Kosuke Fukudome, and Chipper Jones all featured prominently. As I’ve grown older, I’ve largely dropped the fun name requirement, gravitating instead toward better players as I’ve come to more fully understand the nuances of the game. Socrates Brito may have a fantastic name, but I’d rather watch David Peralta or A.J. Pollock take those at-bats. Despite this evolution, one name that has stayed in the upper echelons of my forever-growing favorite player list is that of the incomparable Wladimir Balentien. Everything about Balentien’s name is perfect — the nearness to “Valentine,” the nearness to “Vladimir,” the incongruity of both of those nearnesses so close to each other. Regardless of his professional success or lack thereof, Balentien makes my list. Balentien played his final game with the Cincinnati Reds on October 2, 2009. In 2010, he took his talents to Japan. I check on Wladimir often, looking to make sure he’s doing all right in NPB. I was excited when he set the NPB home run record back in 2013, even if it was marred by the juiced ball. I felt 32 home runs in Balentien’s 32nd year of life was particularly poetic, especially considering his propensity for 31 home run seasons, and I was overjoyed last offseason when it was reported that Balentien wanted to make his way back stateside. He didn’t return. Ultimately, the rumors proved false, and Balentien signed a one-year, $3 million extension with the Yakult Swallows, playing his eighth season in Japan and hitting 38 home runs along the way. All of which is to say that now, a year later, with the World Series done and the rumor mill churning: I believe Wladimir Balentien deserves a job in major league baseball. We’ll examine the case for him, and learn more about the free agent market in the process. Pretend for a second that you are a small market major league general manager in need of an outfielder. He doesn’t need to be an All-Star nor does he need to be a long-term solution, but you are looking for three things: middle of the order power, on-base skills, and as inexpensive a contract as is possible. Your first thought might be to trade for a major league-ready prospect. The top of MLB.com’s prospect board is stacked with outfielders in Triple-A, or who have limited major league playing time, and all of them would bring multiple years of team control at the league minimum. Without minor league baseball Statcast data for exit velocity or launch angle, you want to focus on ISO, walk rates, and strikeout rates as proxy. You ask your associate to create a blind list of the top Triple-A outfielders, not wanting to influence your thinking with prior biases. The associate soon returns with five potential prospects and a mischievous grin. Thinking it over, you initially pick Player 2, who looks like the best fit, what with his high walk rate and high ISO. Your associate then reminds you that the Astros announced Kyle Tucker was untouchable at the 2018 trade deadline. You harrumph and quickly dismiss Players 3 and 5, who you come discover are Victor Robles and Alex Verdugo. Even though they have nice K/BB rates, their power is lacking and you want someone with some thump. Of course, the downside to signing Balentien —that he’s 34 and has already washed out of the majors once — cannot be overlooked. And there’s the matter of the quality of NPB play more closely resembling Triple-A than the major leagues. All three are compelling reasons for teams to overlook Balentien, especially with the number of 20-something minor leaguers looking for a shot at the league minimum, but with Balentien, you need to look deeper. For one, Balentien’s age doesn’t carry much risk given he would likely sign a cheap one- or two-year deal. Aging curves indicate that players begin to steeply decline around their age 30 season and that by age 34, Balentien’s potential re-entry age, they could lose nearly 40 points of wRC+ from their peak. In 2018, Balentien recorded a 126 wRC+, a number which can be expected to drop to around 120 based on aging alone before accounting for the NPB to major league jump. But again, Balentien won’t command much more than $3 million a year he’s making in Japan now, which would be a sound investment even with 0.5 WAR of production. That kind of deal makes the most sense for teams with a top outfield prospect close but still a couple years away, like the Giants or Orioles. Or perhaps a possible contender in a tough division like the Cardinals, who wouldn’t mind another decent power bat off the bench. In either scenario, the extra couple million of payroll compared to a mid-20s non-prospect’s salary means little to a billionaire owner. Also, since Balentien left for Japan, the majors have undergone something of a hitting revolution. Strikeouts are accepted as long as a hitter walks enough and produces extra base hits. It’s the three true outcomes model, one which Joey Gallo takes to the extreme, and Wladimir Balentien was built for that kind of hitting environment. Because there aren’t Statcast numbers for the Japanese league, I’ll continue using ISO, walk rates, and strikeout rates as proxies. If Balentien had played stateside in 2018, his .265 ISO would have ranked seventh for all major league outfielders. 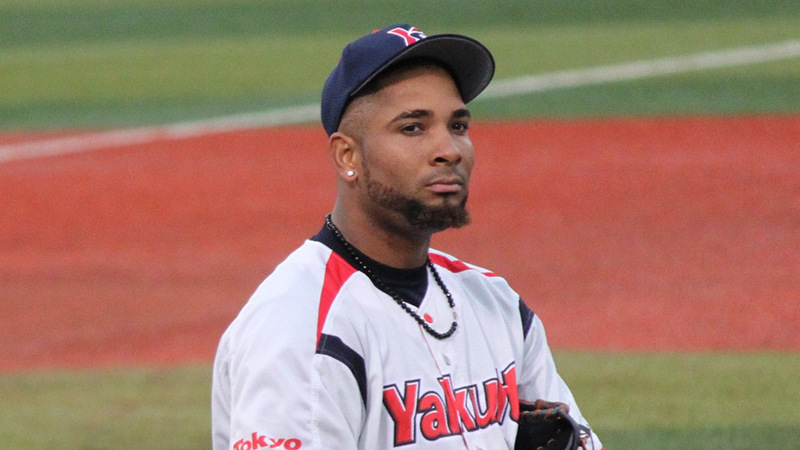 Across his eight years in NPB, Balentien has slugged .559 with a .287 ISO. Only Gallo’s .295, and Aaron Judge’s .292 are higher ISOs across the same eight-year period. However, each has only a third of the plate appearances that Balentien does. The closest ISO comparisons to Balentien’s NPB numbers with similar sample sizes are Giancarlo Stanton at .283, and Khris Davis at .271. In addition to hitting for power, Balentien has maintained an excellent 14.6 BB% and a routine 21.4 K%. He outdoes both Stanton (11.8 BB% / 27.7 K%) and Davis’ (8.6 BB% / 26.6 K%) numbers, while falling perfectly in line with Mike Trout (14.8 BB% / 21.4 K%). Based on just these rate stats, Balentien outperformed Charlie Blackmon, George Springer and Giancarlo Stanton, three players who cost nearly $50 million combined in 2018, last year. Of course, Balentien played in a less arduous league, so we cannot expect him to duplicate an All-Star level of production for a major league team. To look at Balentien more holistically though, he posted a 126 wRC+ for the Swallows in 2018. That followed 2017’s 131 wRC+ mark, 138 in 2016 and, prior to an injury-lost 2015, a 163 wRC+ in 2014. Were Balentien’s 126 wRC+ have occurred in the majors, he would have tied for 18th among outfielders with the Dodgers’ Joc Pederson. Gallo, for reference, recorded a 110 wRC+ in 2018. During his brief major league career, Balentien had a 72 wRC+, below a league-average hitter and far from the above-average marks he’s posted in NPB. Even though Balentien’s skillset might be more acceptable to major league teams these days than it was when he last played for the Reds, he still has to have that success translate back for him to be worth signing. First, let’s return to our earlier GM hypothetical. When compared to the top four Triple-A outfield prospects, three of whom are ranked among the majors’ top five prospects, Balentien held his own. He posted the highest ISO and highest walk rate of the five, but hit for the worst average and worst strikeout rate. By no means is he perfect, but if Balentien had put up the numbers he did in NPB as a 22-year-old in Triple-A, every GM would be checking his availability. My point is that Balentien has displayed similar production to multiple top-100 prospects at a comparable level. While those prospects come at an astronomically high acquisition price via trade, Balentien can be signed for relatively little. When acquiring Balentien, a team wouldn’t be looking for a future franchise cornerstone like Jimenez or Tucker; it would be looking for a fourth outfielder better than the team’s current option. If a better fourth outfielder sounds irrelevant when thinking of roster construction, remember that Steve Pearce, Boston’s fourth outfielder, just won the World Series MVP award. I looked at FanGraphs’ depth charts, and identified the following 30 players who are projected to fill the role of fourth outfielder in 2019. On average, the projected fourth outfielders posted an 87 wRC+, with a .131 ISO, 7.7 BB% and 23.0 K% in 2018. Wladimir Balentien’s NPB ISO and walk rates doubled that of MLB fourth outfielders, and his wRC+ was nearly 50 points higher. In fact, the only projected fourth outfielder with a higher ISO or wRC+ than Balentien in 2018 is Lane Adams, who only recorded 29 plate appearances. For his career, Adams has a 109 wRC+ with a .204 ISO and a K% over 30. The question then becomes not if the jump from the NPB to the majors would negatively affect his production, but by how much. If Balentien can maintain production similar to what he produced in the NPB, he immediately becomes an upgrade over every team’s outfield bench bat. Back in 2015, Justin Perline of Beyond the Box Score attempted to quantify how much effect the jump has on the three true outcomes. Perline found in a sample of 12 NPB hitters who switched that while strikeout rates remained the same on average, walk rates dropped by 2.9 percent. Likewise, home run percentage dropped 2.9 percent and ISO dropped seven points. Assuming Balentien’s stats experienced a similar drop in average drops as Perline found, the slugger would still outperform most of the outfield bench options while also out-walking and out-slugging Springer, Blackmon, and Stanton. It’s a small sample so no concrete conclusions can be drawn, but it does seem like Balentien would more closely resemble the Japanese version of himself than the 2009 American version. Balentien struggled with the same growing pains that so many young ball players do, but because the league valued high-OBP guys more than high-ISO ones, Balentien washed out before he got his bearings. It’s a sentence I keep returning to because, as I watch this video, it’s easy to wonder how a man who could hit a ball so ferociously couldn’t stick in a league that now obsesses over exit velocity. Nearly every last one of Balentien’s 55 home runs in that video is a no-doubter. You can hear every mph of the exit velocity. Oddly enough, every home run Balentien hit on a multiple of seven sounds more authoritative, even more destroyed than the rest. Number 21 aroused a particular twinge of sympathy in me for the ball, an inanimate object, because that kind of power must make the unfeeling thing feel something. At the tail end of Balentien’s third season in Japan, Ben Lindbergh asked a pro scouting director whether Balentien deserved another shot. The scout said he wouldn’t roll the dice on Balentien but understands why some teams might want to take the chance. Of course, none did. That’s the flip side of having a memorable name. You get some, like me, who cherish you despite your shortcomings or extended absences. And you get others who remember only the shortcomings and take the extended absence as confirmation of what they already believed to be true. General managers know players who are familiar, and it’s easier to justify a familiar failure than an outside-the-box one. The reticence to branch out from traditional free agent pools is common in baseball. Even in FanGraphs’ Top 50 Free Agents list, only one foreign-based player is listed. And while Yusei Kikuchi certainly deserves the greatest consideration of the available international free agents, there is a wealth of talent outside of the majnor leagues beyond the banner names. It may not be break-the-bank talent like Manny Machado or Bryce Harper, but it’s certainly could be enough to swing the tide of a season and might be more than a quickly deteriorating Ian Kinsler can offer. Think of Miles Mikolas, who ledthe Cardinals’ rotation this year, or Eric Thames, who broke out for the Brewers the year before. Neither carried particularly lofty expectations coming into the year; neither made FanGraphs’ Top 50 free agent lists. The lists are subjective of course, but my point is there are players who can make a difference who don’t make the cut. Teams are beginning to invest ever-greater resources in pro-scouting Japan, suggesting that less familiar sources of talent are worth exploring. At the very least, the mistakes tend to be less expensive than the familiar ones are. Wladimir Balentien may not be the next Mike Trout or Giancarlo Stanton, and he may not even be a Mikolas or a Thames, but he could change the course of team’s season. He deserves that shot at least. Socrates Brito – the unexamined prospect is not worth drafting. To me Balentien is a DH only bat, a very good DH only bat that is a worse and younger version of Nelson Cruz but cheaper. He’s a DH only at this point, unfortunately, which just isn’t valued very highly in the MLB in 2018. He’s only playing the OF in Tokyo because the CL doesn’t have the DH. If you listen to interviews with him, he brings up, with some frequency, the fact that he’s hoping the CL adopts the DH soon so he can continue his career longer. He’s got two bad legs. Awesome story though, and good on you for the NPB writing — we need more of it. As you point out, his wRC+ has been 163, 138, 131, and then 126. He may still be better than the average 4th outfielder, but that’s a very clear not good trend that will add on to joining a harder league. I really like this – but if you’re a small market major league general manager you can just ask all of your scouts who have seen him play, and then send some to look at him. Great write-up, thanks. Let’s hope he gets a shot in the MLB, it will be fun to see how it pans out.